Paul Anka wrote "You Are My Destiny" in 1958. I was eleven years old, impressionable times. He and every guy who was even vaguely cool had hair like this. It was a prelude to Sandra Dee and James Darren and "Gidget" movies. I was believing this stuff, these American fairy tales. Any appeal of Ancestral Voices or destiny was muted by the lyrics of Anka's pop tune; the promise that I could be(come) one of them as real as the feeling of fullness from eating sliced white bread. I ate it up. "You weren't alone," my husband chimed in as we ate a late breakfast: a pot of simmered turkey thigh with mushrooms, onions and yams topped off with Mung Bean Threads, what we call "Long Rice". Delicious! "What a goulash." He was talking about the meal, but life is a goulash as well. In the more than fifty years since I first listened to "You Are My Destiny" I have not thought about the song more than I have Sandra Dee. Not on my list of prime mover material. Until this morning. I got a fever for Easter. Really! You can read about one version of that here, the 'medicine story' version. What I didn't write into the medicine story, and letter to the mythic granddaughters, is what happened when Pete and I made our latest visit to the Wing Luke Museum the other day. What happened at the Wing Luke Museum? For weeks now I have been promising myself a field trip to see people who look like me, speaking languages and dialects different than American English, and the current edition of Sandra Dee or versions similar; tasting food my family might serve up. Sometimes it becomes more than I can handle to be a "Hawaiian woman" who serves as a tour guide for people who believe they would love to live in Hawaii, or wanna appropirate someone else's culture. Mine. I long for a taste of my roots. Between the many activities that come up when season's shift, and winter gives way to spring, there was a opening for the field trip. Thursday. 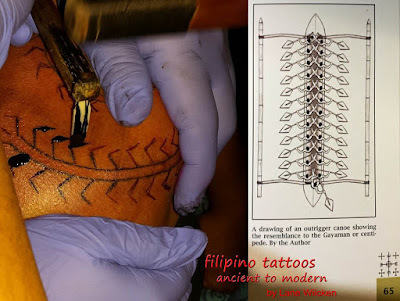 I had been fueled with the description of the latest exhibit at Seattle's Wing Luke Museum, TATAU/TATTOO. I read the pages of the Museum's website, describing the exhibit, and found a quote from Samoan writer, poet Albert Wendt, Albert Wendt who married my high school classmate was writing about something I needed to know, now. I needed to replace more of those Sandra Dee-James Darren movies from my backbone. I read Wendt's words again and again. And then we took a drive off the island and headed to Seattle. First stop: The Wing Luke. Well, actually, our very first stop was A Piece of Cake. Egg Custard tarts for Pete, and Oatmeal-Black Sesame Cookies for me. Once inside the Wing Luke, we listen to the fast-talk of the young woman at the ticket counter. We pay our Senior-rate ticket, and she binds us with a paper bracelet that allows us to come and go. We only come/go once. Up the steep stairway, to the left, through two double-doors. 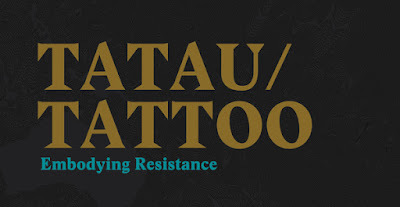 Tatau/Tattoo. The exhibit is tucked in the middle of other exhibits describing and visually exhibiting the lives of Pacific Island populations ... 'people who look like me' and are the same blood that is me. Pete lingers at the photographs and description of the Alaska Fisheries Filipino history. Unionizing workers. That is a lineage that speaks directly to Pete's blood. Union Work he will always be. 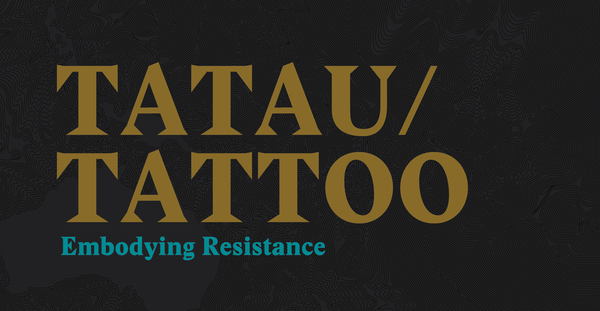 I head directly to Tatau/Tattoo. I know my limitations as a Pacific Island woman with MCS. I will be challenged to be inside a building, with many different materials, scents, chemicals etc. et.al. I zero in on my target, my prime reason for the field trip. A bee after the nectar. 1. The photograph of a Filipina elder proud and ancient with her elbows bent and hands in the air as she displays her tattoos. It's her smile, her face. Familia. 2. 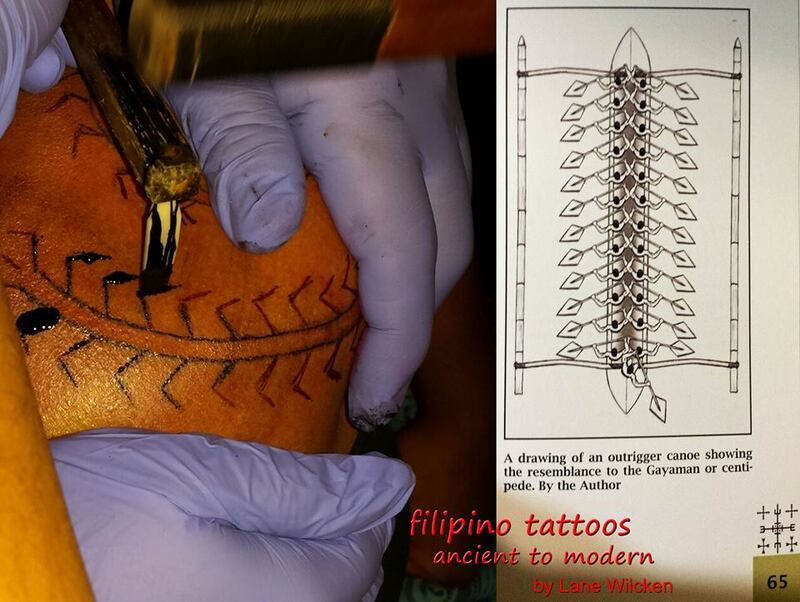 The pegged samples of traditional tatau/tattoo designs and their meanings beckon. The one that grips me by the throat is that one of Centipede. CENTIPEDE. From the crevices of my once long-muted Ancestral voice box, crept Gayaman (centipede). First, it showed up in a 'fairy tale' a medicine story. Then, it showed up in the Wing Luke, and then, we showed up at the Wing Luke. Aiyah. 'Aue. Gayaman, friend of the headhunter, 'aumakua, another form of the backbone, the Mo'okuauhau. 3. And then this postcard was tucked into a display box. 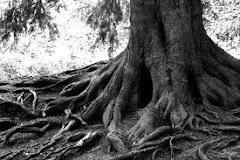 tree.” *I track this quote down. We were inside the Wing Luke for less than an hour, but, Tatau/Tattoo had done it's work. We were reminded of our histories, and "The pattern glitters with cruelty" as Edrich wrote. The colonization of peoples, including my Filipino and Hawaiian ancestors, attempted to wipe the slates clear to make us versions of Christian or Sandra Dee, but we resist. The process is embedded or beaded into the pattern of my place in the world, just as Edrich said, "[S]ewn into the fabric of life ..." Sixty years is not such a long time to remember something much different (or is it) from the promises of satisfaction and destiny in pop culture's music or contemporary 'Gidget' tales. The effects of our Wing Luke visit keep stinging me with awareness, awakening me to the bones or gaps between the bones in my vertebrae which have been numbed. Those places that seek out the simplified version of history or inheritance are soothed by pastry promises: white bread, coconut cream pie, and plate lunches that used to satisfy. Our field trip included two others stops to find that coconut cream pie, and a catfish sandwich. Let me keep it short, this already rambling adventure, and tell you the pie was less than best, and the catfish sandwich was no longer. The place where once we ate those sandwiches is gone. Gentified Georgetown, Seattle. We could not find those sandwiches. "I don't wanna be your Tour Guide, honey. No amount of money will satisfy my hunger. I don't wanna be your Tour Guide, honey. Let me show you my tatau."